Google’s self-driving cars sparked some undeserved controversy earlier this year when talk began circulating that the cars had been in several accidents over the last several years. Just one of many responses to this, Google co-founder Sergey Brin took the stage at the company’s annual stockholder meeting in early June to address the issue, further detailing what kinds of accidents the cars had seen up to that point. In addition, the company began publishing details on a monthly basis about the self-driving car’s accidents, total number of miles driven, and other data points to keep the public informed on its progress. 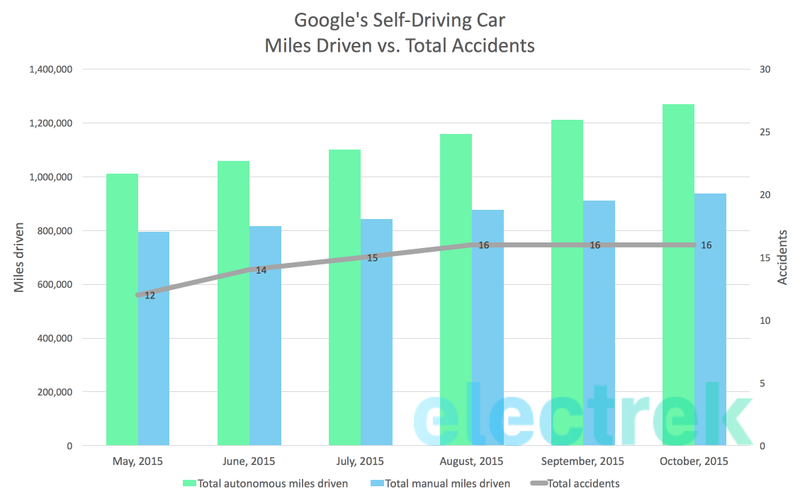 But it appears, at least according to Google’s own reports, that the self-driving cars have somehow added a total of exactly zero new accidents to their record over the last couple of months. This compares to the end of June, which saw two new accidents involving mistakes made by human drivers. July saw another accident, and the month of August saw yet another. And while Urmson’s words will hold true in the future, Google’s cars have managed an impressive record this fall. The last self-driving car accident occurred on August 20th, 2015, involving yet another human driver that struck the vehicle. This is pure coincidence. While the cars just happened to have a rough summer (with a couple of accidents per month), Google’s cars are back to their usual track record of not being in any accidents. It’s worth remembering that the dozen or so accidents that Google detailed in its first May report happened over the course of six years, and while there were certainly far fewer miles driven over the course of that time, the cars actually had a good track record. Most months didn’t see any accidents. Google’s self-driving cars are genuinely getting better at avoiding accidents, even if the cars themselves are not at fault. The cars obviously avoid accidents and have reactions to situations that humans would never be capable of, so it’s likely that this technology is already nearing safety that is better than human drivers. The cars are actively learning as they approach more and more scenarios, and many of these scenarios involved the mistakes of humans (other drivers and pedestrians alike). Google is better learning how to train its safety drivers. At least when it comes to the Lexus cars, Google installs safety drivers that are able to take over the vehicle if the car’s autonomy isn’t smart enough to handle a situation effectively. Sergey Brin hinted that these drivers were responsible for at least a few of the cars’ first dozen accidents, and it’s likely that as the technology has developed, Google has become better at training these drivers to handle uncontrollable situations in a smarter way. At the end of September, The Wall Street Journal detailed many ways in which Google was hoping to improve its cars and make them drive more like humans. Examples of this include programming the cars to take a very wide approach on turns (rather than the geometrically-correct ones that the cars would perform by default) and braking at even the slightest sign of danger. It’s possible that these improvements have contributed to an improved record of accidents. This is purely speculation, and possibly a stretch, but another factor that may be contributing is that drivers have started to become more comfortable with the thought of self-driving cars. And with the attention that they got earlier this year (and the media’s sensational headlines), it’s perhaps possible that those who are now aware of the cars existence are now more careful when driving around them. These are a lot of potential reasons that Google’s cars have been getting in less accidents, and the truth is probably some combination of them. With the media attention that the cars got earlier this year, it’s imperative for Google and for the prospects for regulation of these cars in the future that they don’t cause more harm than they prevent. Google’s “don’t be evil” slogan comes to mind when considering how the number of accidents that these cars cause could make or break their adoption and acceptance from regulators and the public in the years to come. Whatever the case, the cars’ track record is impressive nonetheless. Google began expanding the effort out of Mountain View into the notably hilly and deer-filled Austin, Texas in recent months, and cars are driving in autonomous mode at a rate of about 50,000 miles per month at this point (with about half that many in being racked up in manual driving). For the sake of many lives on the road now (and those of future generations as well), I hope that this record keeps up.